San Jose Animal Advocates has recently launched a new initiative called "Last Chance Pet Project". Read about what the program is, and how it works here. Even though many animals are adopted from our shelters and rescue groups, there is still a major problem of adoptable animals being euthanized in California (estimated at over 1 million). Despite these grim statistics, as a community we can take a stand and help try to save one at a time. The animals who are included in our Last Chance Project are located at the San Jose Animal Care Center, one of the largest shelters in California and are at potential risk for euthanasia. 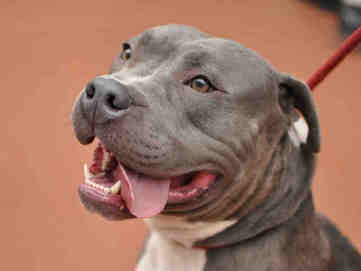 About Spencer: Spencer is a very handsome blue and white pit bull terrier. This guy is extremely loveable, loves people, loves other dogs, loves life!!! He has been waiting for the right person to find him to start the next chapter of his life. Playful and fun loving outside the kennel, Spencer is feeling the stress of the shelter environment and has only been given a few more days to be adopted, or sadly, will be humanely euthanized. This active young dog only wants to be with his people and run and play! Spencer loves other dogs, and even loves hanging out in a baby pool! 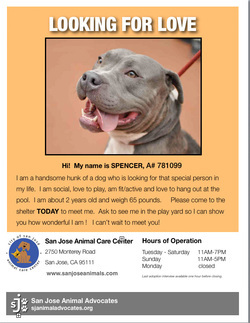 Help us campaign for Spencer and find him a forever home before it is too late! Network for Spencer! Spencer has his own Facebook page. Please help us get the word out about him. We have only a few days to get this dog out of the shelter alive! Donate to our cause - We are asking for small donations (no amount is too small) to help us fund Facebook ads for these endangered shelter pets, like Spencer. Our past experience with this method of getting the word out has been HIGHLY successful. Instead of buying a coffee today at Peet's/Starbucks, donate a few dollars to help save a life! Please click on the ChipIn link below to donate. anywhere you think Spencer's new owner can be found!